Şimşek, S., Özdalyan, B., and Saygın, H. (2019). "Improvement of the properties of sugar factory fusel oil waste and investigation of its effect on the performance and emissions of spark ignition engine," BioRes. 14(1), 440-452. The effects of using blends of unleaded gasoline and refined fusel oil on engine performance and exhaust emissions were analyzed. Prior to the experiment, the fusel oil, which is the final waste product of the sugar factory, was developed to have the chemical properties that can be used in internal combustion engines by removing water and gum contained therein. A four-stroke, single-cylinder, spark-ignition engine was used for the experiments. The tests were conducted at a fixed speed and under different loads. The test fuels were blended with fusel oil contents of 5%, 15%, and 30%. Under each load, the engine’s performance and emissions were measured. Throughout the experiments, it was observed that engine torque and fuel consumption increased as the amount of fusel oil in the blend increased. Nitrogen oxide (NOx), carbon monoxide (CO), and hydrocarbon (HC) emissions were reduced as the amount of fusel oil in the blends increased. Petroleum, the major source for the production of engine fuels, is being depleted, while levels of environmental pollution are increasing due to the hazardous exhaust emissions of petroleum-based fuel-operated vehicle engines. These facts have led researchers to study alternative energy sources. In particular, ethanol, methanol, natural gas, liquefied petroleum gas (LPG), and biofuels, all of which have lower exhaust emissions, are being considered as alternative fuels (Çelik and Balki 2013). Biofuels are the most promising option among the latest alternatives that are rapidly gaining popularity. The fuels used for internal combustion engines must be able to be produced abundantly and stored easily, thereby reducing dependency on imported fuels. Additionally, these fuels must be inexpensive, have high heating values, and produce less exhaust emissions than petroleum-based fuels (Çelik and Çolak 2008; Liu et al. 2018). With new technology developing, a rapidly increasing world population, depleting petroleum reserves, and increasing fuel costs, alcohol production by fermentation has become popular, as it contributes to the national economy directly and significantly. This would lead to saving and better utilizing of national resources. In the processes of alcohol production through fermentation, alcohol-containing fuels, such as ethanol, methanol, butanol, and biofuels, are obtained. Ethanol is used in spark ignition engines at specified ratios in the fuel. Ethanol is a colorless, transparent, slightly odorous, and hygroscopic liquid. The hydration of ethylene and fermentation of sugary plants (e.g., potatoes, grains, sugar cane, and sugar beets) already take place on an industrial scale (Sümer 1999; Zheng et al. 2016). Fusel oil is sugar beet molasses waste. Fusel oil is a by-product that is recovered during the distillation of industrial ethyl alcohol production by fermentation (Suslick 1998). This by-product is a liquid with a strong odor and color that ranges from yellow to dark brown. It is used to generate power in factories, to produce methylated spirits, or is merely disposed (Welsh and Williams 1989). The composition and amount of fusel oil obtained may change depending on the type and preparation of the carbon source used in the process of alcohol production, as well as the method used to separate fusel oil from the by-product solution. Fusel oil is the only natural source of straight and branched-chain monohydric alcohols with 2 to 5 carbons (Sayin et al. 1984; Suslick 1998). Fusel oil is composed of low molecular weight alcohols (e.g., i-amyl alcohol, i-butyl alcohol, n-propyl alcohol, n-butyl alcohol, ethyl alcohol, and n-amyl alcohol), water in small amounts, aldehydes in trace amounts, fatty acids and their esters, high molecular weight alcohols, and terpenes (Erdem and Durukan 1991). The first study concerning fusel oil was conducted by Wetherill in 1853. Since that year, there have not been many studies concerning fusel oil. Furthermore, existing research concerns the hazardous effects of fusel oil, the methodology of reducing fusel oil in alcoholic beverages (Kunkee et al. 1983), analysis of fusel oil and ethanol contained in alcoholic beverages through the use of high performance liquid chromatography (HPLC) (Neale 1988), dehydration of fusel oil (Kraetz 1988; Vauclair et al. 1997; Ferreira et al. 2001), production of lubricants from fusel oil using the enzymatic method (Dörmő et al. 2004), and biodiesel production (Salis et al. 2005). The physical and chemical compositions of the fusel oil used in this study were tested in the chemistry and energy laboratories of TÜBITAK’s Marmara Research Center (MRC; Kocaeli, Turkey). The results are shown in Table 1. Today, alternative fuels that can be used in engines are very important in reducing oil dependency. However, the damage caused to the environment by all of the involved processes, including the production and use of alternative engine fuel, should also be taken into consideration. This study investigated the impacts on the performance and exhaust emissions of a spark ignition engine from the incorporation of fusel oil produced from vegetables into the engine’s fuel. Table 1. 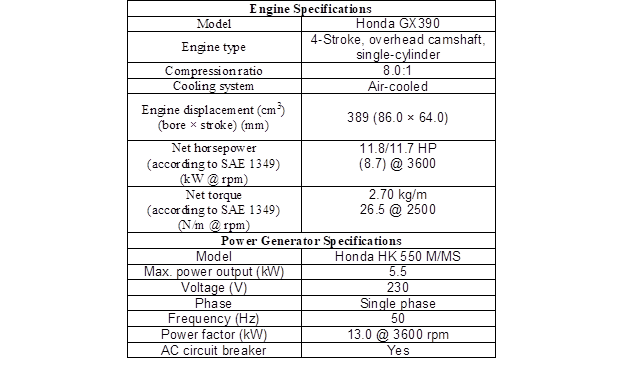 Characteristics of Fusel Oil Composition (Şimşek et al. 2018). Four fuel blends were prepared using different unleaded gasoline to fusel ratios. The fuel blends used were F0 (0% fusel oil + 100% unleaded gasoline), F5 (5% fusel oil + 95% unleaded gasoline), F15 (15% fusel oil + 85% unleaded gasoline), and F30 (30% fusel oil + 70% unleaded gasoline). 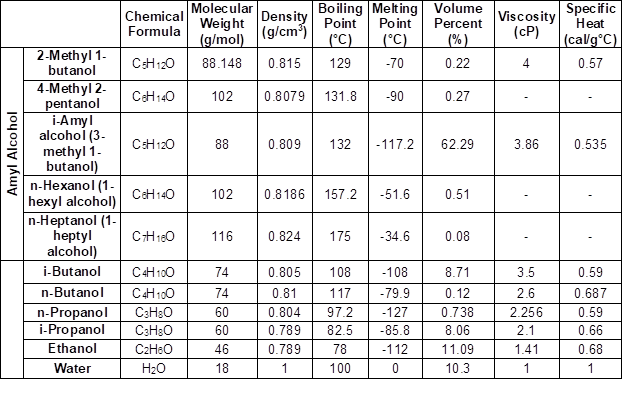 An analysis of the fusel oil fuel blends was conducted by TÜBITAK MRC, and the results are shown in Table 2. Fusel oil, a factory waste, cannot be used as fuel in engines because it contains gum and water. This gum prevents it from mixing homogeneously with gasoline. It is considered that the high amount of water it contains also creates an increased vapor pressure that has an adverse effect on piston head motion during power strokes. Therefore, it needs to be processed to reduce the gum and water content. Thus, this processed fusel oil can be used for experiments on engines. The primary method used to separate the liquid mixtures is distillation. The principle in this method is to separate the liquids by using the differences between their boiling points (Holland 1975). Because the higher alcohols in fusel oil result in an azeotrope, a simple distillation process can be conducted (Robinson 1922; Izarraraz et al. 1980; Mommessin and Benizen 1980; King 1982). 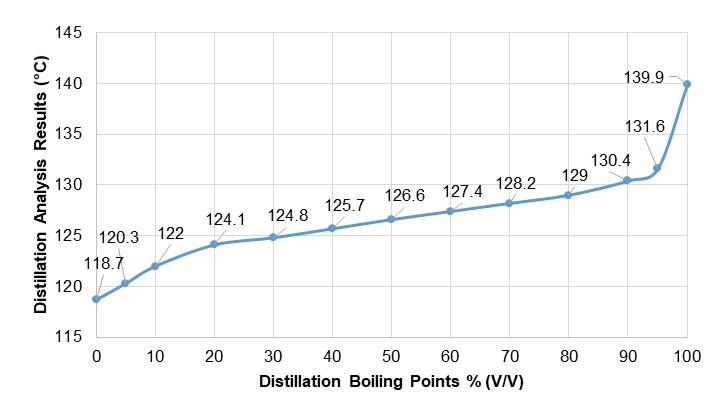 Figure 1 shows the distillation temperatures of fusel oil. Molasses fusel oil was used for this analysis. This substance is a greasy liquid with a density of 818.6 kg/m3 at 15 °C, with a green to yellow or brown color. It was found that it contains 240 mg/kg water and that its flash point is 39.5 °C in distillation analysis. According to the results obtained through petroleum products analysis tests in this study, the distillation efficiency of fusel oil at its final boiling point was 96.5%. Additionally, the limit defined in TS EN 228 (2013) for existent gum content is 26.6 mg/100 mL. Using gum inhibitor only, the existent gum content was reduced to 13.4 mg/100 mL. It was observed that the gum content of fusel increased when fusel was stored in fuel tanks. At the end of the experiments, the existent gum content was reduced to 0.8 mg/100 mL using gum inhibitor and desiccant together, without letting the fusel oil obtained by fermentation settle. Removing the water from fusel oil enabled the distillation of alcohols at lower temperatures. However, this did not lead to any notable changes in the amount of alcohols. For that reason, the fusel oil was supplied with 5 lt/2 kg molecular sieve Z4-01 (2.5 to 5 mm) desiccant and when the fusel oil was stirred, the gas that accumulated inside was discharged. This process was repeated at least twice every other day, and fusel oil settled for two more days. The settled fusel oil was filtered using cotton, ordinary filter paper, and 1 kg molecular sieve Z4-01(2,5-5 mm) desiccant. The mixture was left to settle for one more night. The analysis after the re-filtering process showed that water contained in the fusel oil was removed substantially (approximately 96.9%). 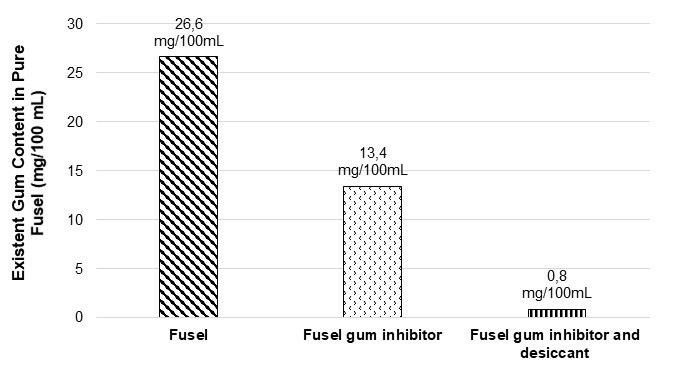 Figure 2 shows the changes in the amount of gum content in fusel oil that was obtained as a result of improvements (Şimşek et al. 2017). A single-cylinder, spark-ignition, four stroke power generator (Honda, Bangkok, Thailand) with carburetor, Honda HK 5500 MS, was used in the experiments. 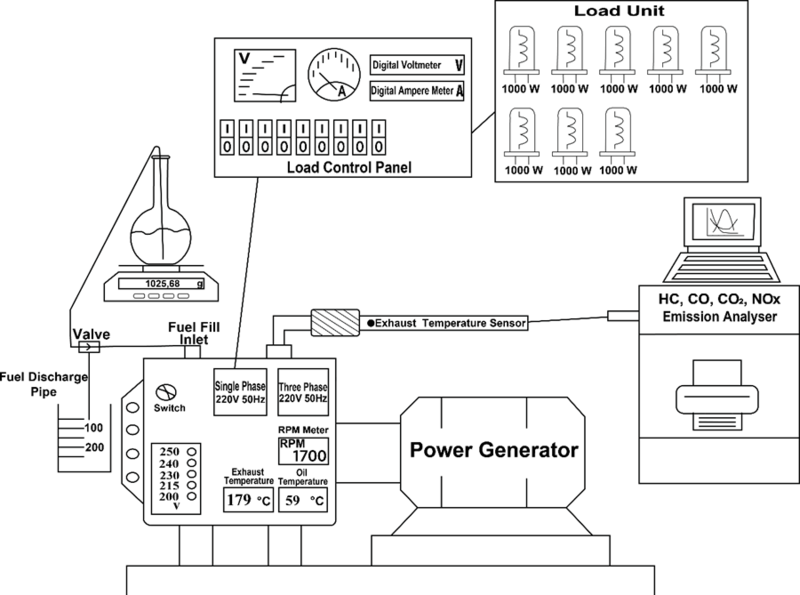 The technical specifications of the engine and the connected power generator used in the experiments are shown in Table 3. To determine the instantaneous fuel consumption, an electronic weighing scale with a weight accuracy of 0.01 g to 2 kg was used. Revolutions per minute, engine oil temperature, and exhaust gas temperature sensors were mounted on the power generator. Because fusel oil has a lower heating value than gasoline, the main nozzle on the carburetor was extended to set the excess air coefficient to 1. Using a cone point carburetor adjustment screw, the nozzle was modified and set to λ = 1 for all experiments. To apply different loads on the fixed-speed power generator for dynamometer purposes, eight projector lamps of 1000 W were used. The experimental setup is shown in Fig. 3. Using a Bilsa MOD 2210 WINXP-K (Bilsa, İstanbul, Turkey) exhaust gas analyzer, carbon monoxide (CO), hydrocarbon (HC), carbon dioxide (CO2), oxygen, and nitrogen oxide (NOx) emissions as well as lambda were measured at precisions shown in Table 4. Before the data collection stage, the experiment engine was run until it reached engine operating temperature with the experiment fuel. Experiments were conducted on stable operation modes by loading with various halogen lamps of 1000 W, 2000 W, 3000 W, 4000 W, 5000 W, 6000 W, 7000 W, and 8000 W. For each fuel blend (F0, F5, F15, and F30) used in the experiments, the engine was loaded with those lamps and used those fuel blends. The resulting engine performance and emissions were recorded. In the experiments, mechanical efficiency, engine torque, specific fuel consumption, and exhaust emissions (CO, HC, CO2, and NOx) were measured. Mechanical efficiency is the ratio of the useful mechanical power obtained from the engine and the energy content of the fuel consumed per unit time. 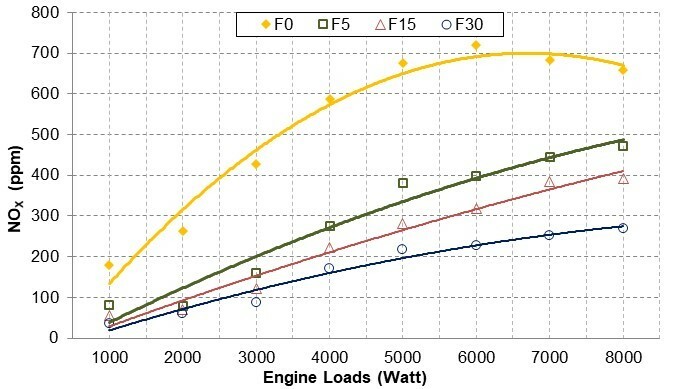 Figure 4 shows the mechanical efficiency achieved by using F0, F5, F15, and F30 fuel blends in experiment engine, in fixed-speed and constant Excess Air Coefficient. Because the octane number of fusel oil is higher than that of gasoline and the oxygen content is high, it is observed that mechanical efficiency increases. Mechanical efficiency was increased by 3.98% with F30 fuel blend, when compared to gasoline. 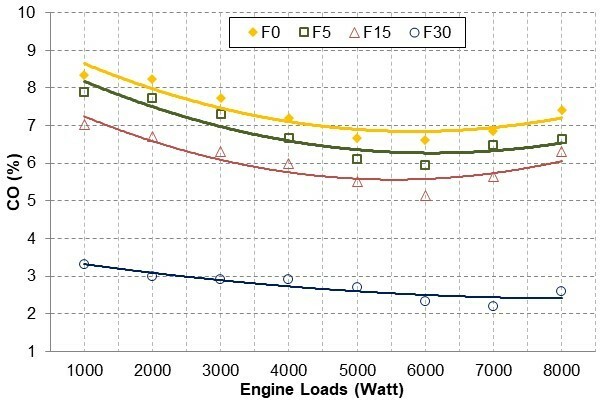 Figure 5 shows that the engine torque per load increased at a fixed engine speed, for each fusel oil blends of 5%, 15%, and 30% with unleaded gasoline (F0). Despite the fact that lower heat values of fuels obtained by blending unleaded gasoline with fusel oil were less than that of unleaded gasoline, the engine torque showed a slight increase. That combustion occurred more efficiently due to the oxygen contained in the fusel oil can be considered as the reason why the engine torque increased as the amount of fusel oil was increased. However, for the same engine displacement, when compared to that of unleaded gasoline, the consumption of fusel-blended fuels increased as the fuel density increased. This led to certain increases in engine torque and effective power. The increase of charge in the cylinder had direct effects on engine torque and effective power. 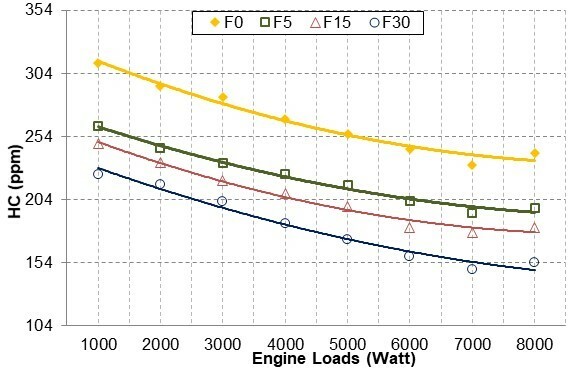 When compared to F0, for all loads, it was observed that engine torque was increased by 0.68%, using F5; 1.49%, using F15, and 3.95%, using F30. The reason for such a reduction is considered to be that mechanical efficiency and engine torque are reduced as the in-cylinder combustion temperature decreases due to lower heat values decreasing as the amount of water in fusel oil increases. There is a satisfactory concordance between the engine torque and changes in power recorded in this research, and that of other researchers (Çelik 2008; İçingür and Calam 2012). It has been seen that fusel oil that contains oxygen improved combustion and reduced CO emission levels. In comparison to F0, the CO emissions decreased as the amount of fusel in the blend increased. For all engine loads, the CO emissions were reduced by an average of 7.45% for F5, 17.76% for F15, and 62.89% for F30. As shown in Fig. 8, HC emissions decreased as the amount of fusel oil in the blend and the engine load was increased. This reduction occurred because fusel oil contains oxygen and, therefore, increases in the engine load increased combustion temperatures. When the excess air coefficient was set to λ = 1, the cylinder was charged with more fusel oil-gasoline blend to achieve the stoichiometric mixture. This was considered to increase the cooling effect of fusel oil within the cylinder. As the amount of fusel oil in the blend increased, HC emissions decreased. For all engine loads, the HC emissions were reduced by an average of 16.86% for F5, 22.74% for F15, and 31.81% for F30. 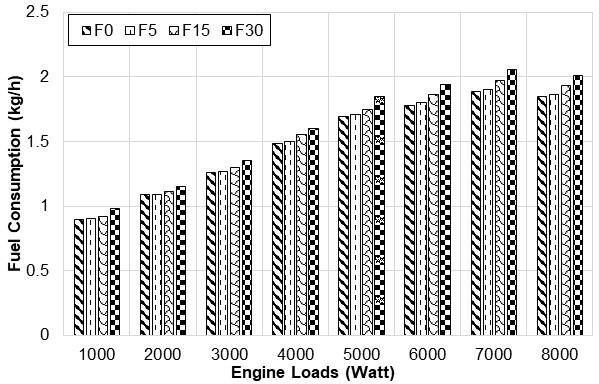 Figure 9 shows that NOx emissions increased as the engine load increased. In comparison to F0, the NOx emissions for all fusel oil blends decreased. This was due to the higher latent heats of vaporization of the alcohols that form fusel oil and the higher flame temperatures required to burn them. Hence, the NOx emissions may change depending on the conditions in which the engine operates and the amount of fusel oil in the blends. For all engine loads, NOx emissions were reduced by an average of 48.98% for F5, 59.38% for F15, and 70.73% for F30. The initial gum content of 26.6 mg/100 mL in pure fusel was reduced to 0.8 mg/100 mL as a result of improvements (by using gum inhibitor and desiccant) and brought into compliance with the TS EN 228 (2013) standard. Due to the higher latent heats of vaporization of the fusel oil-gasoline blends, when compared to standalone gasoline, the F5, F15, and F30 blends increased engine torque by 0.68%, 1.49%, and 3.95%, respectively. Incorporation of fusel oil, which has lower heating values than unleaded gasoline, led to an increase in specific fuel consumption as the amount of fusel oil in the blends increased. The lower stoichiometric air/fuel ratio of fusel oil (relative to gasoline) required that the cylinder be charged with more fuel to create the same heat created by gasoline and to obtain the same stoichiometric mixture. This increased the cooling effect of fusel oil within the cylinder and led to lower NOx emissions, when compared to unleaded gasoline. A higher oxygen content of fusel oil resulted in decreased CO and HC emissions as the amount of fusel oil in the blends increased. The authors would like to thank Karabuk University Scientific Research Projects Department for their support during this study. Çelik, M. B., and Balki, M. K. (2013). 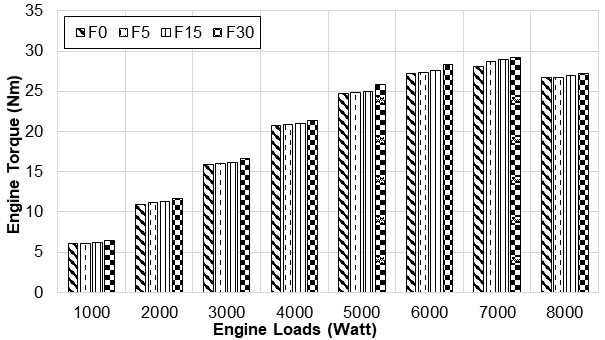 “The effect of LPG usage on performance and emissions at various compression ratios in a small engine,” Journal of the Faculty of Engineering and Architecture of Gazi University 22(1), 81-86. Çelik, M. B., and Çolak, A. (2008). “The use of pure ethanol as alternative fuel in a spark ignition engine,” Journal of the Faculty of Engineering and Architecture of Gazi University 23(3), 619-626. Erdem, F., and Durukan, E. (1991). “Seperation of fusel oil into franctions and its evaluation,” Şeker Enstitüsü Raporu 21(7), 1-10. İçingür, Y., and Calam, A. (2012). “The effects of the blends of fusel oil and gasoline on performance and emissions in a spark ignition engine,” Journal of the Faculty of Engineering and Architecture of Gazi University 27(1), 143-149. Izarraraz, A., Bentzen, G., Anthony, R., and Holland, C. (1980). “Solve more distillation problems,” Hydrocarbon Processing 59(195), 195-203. King, C. J. (1982). Separation Processes, McGraw-Hill, New York, USA. Kunkee, R., Snow, S., and Rous, C. (1983). “Method for reducing fusel oil in alcoholic beverages and yeast strain useful in that method,” Biotechnology Advances 1(1), 148. Liu, H, Ma, G., Hu B., Zheng, Z., and Yao, M. (2018). “Effects of port injection of hydrous ethanol on combustion and emission characteristics in dual-fuel reactivity controlled compression ignition (RCCI) mode,” Energy 129, 592-602. Mommessin, P., and Benizen, G. (1980). “Solve more distillation problems another way to handle reactions,” Hydrocarbon Processing 60(7), 144-148. Robinson, C. (1922). Elements of Fractional Distillation, McGraw-Hill, New York, USA. Sayin, I., Sunay, M., and Yilmaz, A. (1984). “Formation of fusel oil and identification of fusel oil obtained from the Eskisehir alcohol factory,” TÜBİTAK Chemistry Research Department 663(135), 1-14. Sümer, M. (1999). Ethanol Usage in Spark İgnition Engines-Performance and Cost Analysis, Master’s Thesis, Gazi University, Ankara, Turkey. Suslick, K. (1998). Kirk-Othmer Encyclopedia of Chemical Technology, Wiley & Sons, New York, USA, pp. 26, 517-541. TS EN 228 (2013). “Automotive fuels – Unleaded petrol – Requirements and test methods,” Turkish Standards of Eurocodes, Ankara, Turkey. Zheng, Z., Wang, X., Zhong, X., Hu, B., Liu, H., and Yao, M. (2016). “Experimental study on the combustion and emissions fueling biodiesel/n-butanol, biodiesel/ethanol and biodiesel/2,5-dimethylfuran on a diesel engine,” Energy 115, 539-549. Article submitted: November 21, 2017; Peer review completed: February 25, 2018; Revised version received: November 19, 2018; Accepted: November 20, 2018; Published: November 26, 2018.